Thanks to everyone who stopped by Monday to check out the summer home tour! If you missed it, be sure to check it out – along with the 9 other bloggers who shared their gorgeous homes! I shared a first look at our guest room. I’m excited about this room! So excited that I finished decorating this bedroom before our own. But hey, this is the one people stay in! First, let me show you the before of this room so you can see the full transformation. My favorite part of the guest room is the headboard decor. I love this canvas – and how it looks between the curtains. 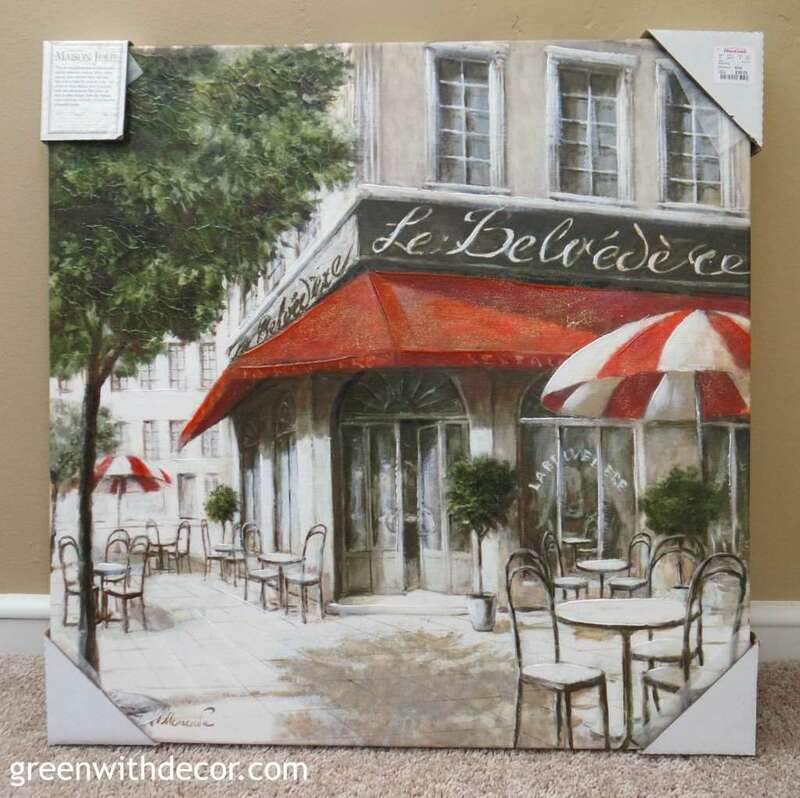 I found the canvas and curtains at HomeGoods (one of my favorite stores!) 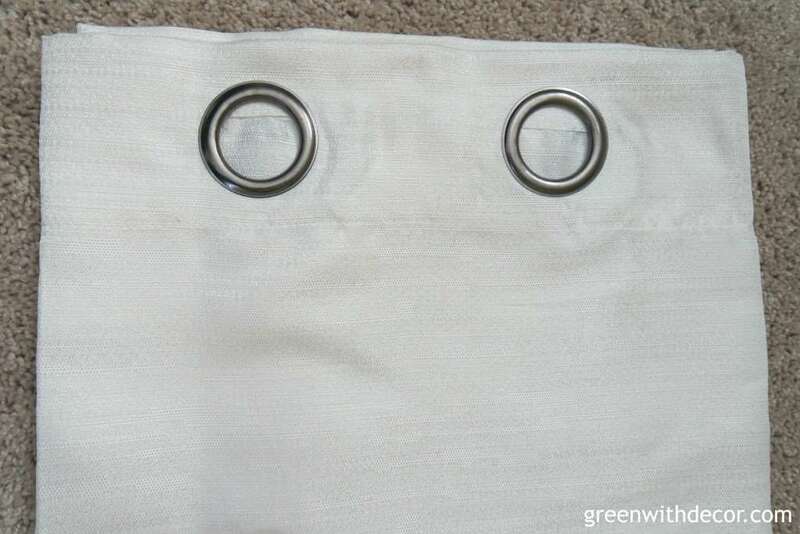 and paired them with this curtain rod. 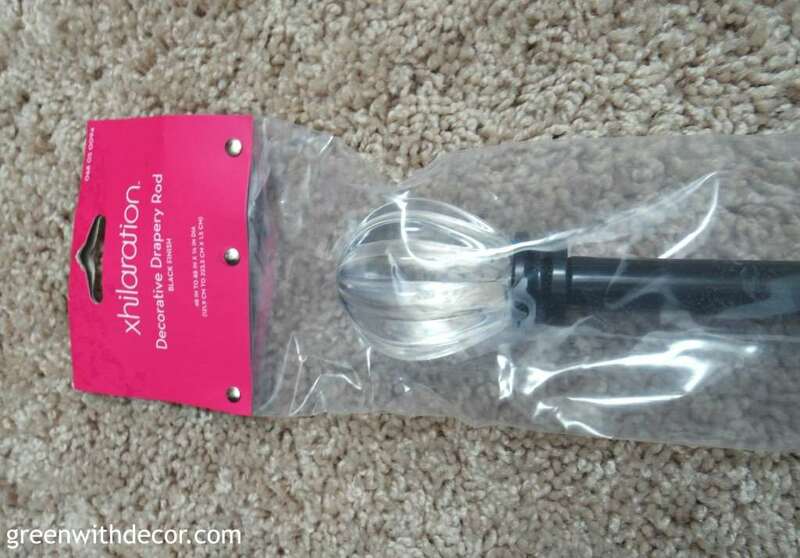 The curtain rod has similar crystal finials as the curtain rods in the kitchen. I love the look! Have you used anything fun and unusual for a headboard look? 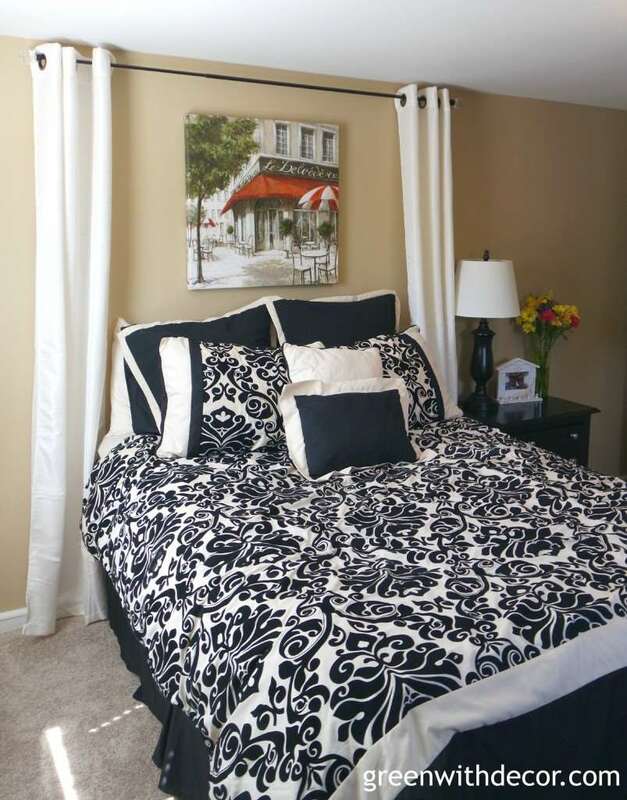 I founds these pictures months after I found the bedspread – they go together so well! We also use the guest room to share some pictures from places we’ve traveled. We bought these New York City pictures on the street there, and I mean literally just the pictures. Getting them home on the plane was a bit challenging – I didn’t want them to get wrinkled or folded! 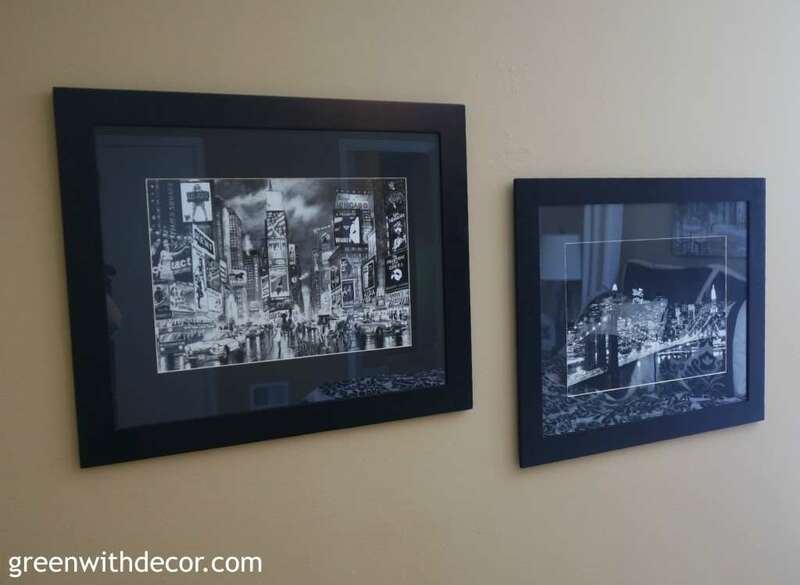 I put them inside black frames – and now they look like nice artwork! I’m not usually one for too many tchotchke souvenirs on vacation, but we found the white picture frame on the nightstand on our honeymoon and thought it was a perfect way to display a memory from our trip. And we had to show off Lambeau Field (where the Green Bay Packers play – this is Wisconsin! ), which we have featured on the recently spray painted dresser. 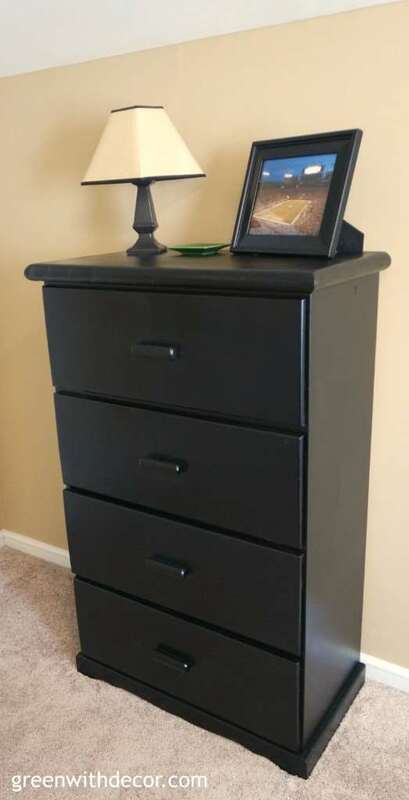 Speaking of spray paint, the nightstand and bench are also spray painted. 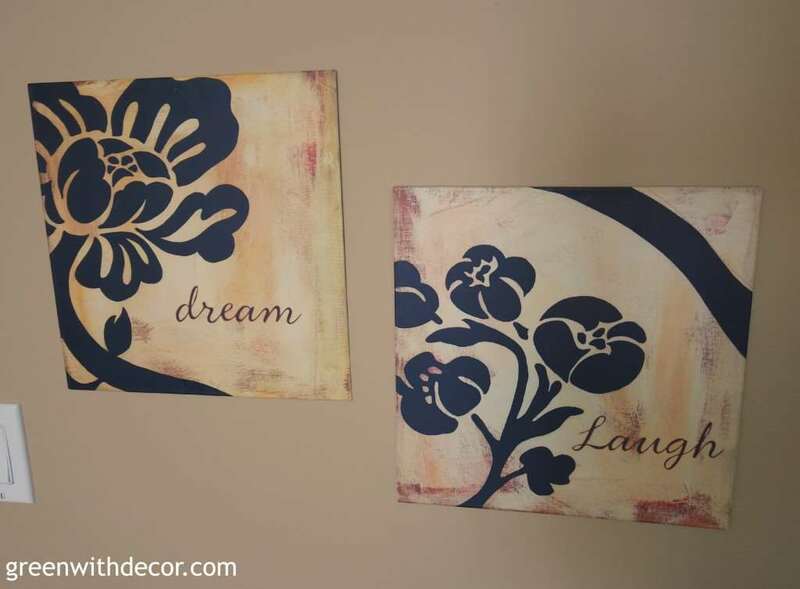 Seriously, I love Rust-Oleum’s black spray paint! And of course I needed to add a bit more green to the room. 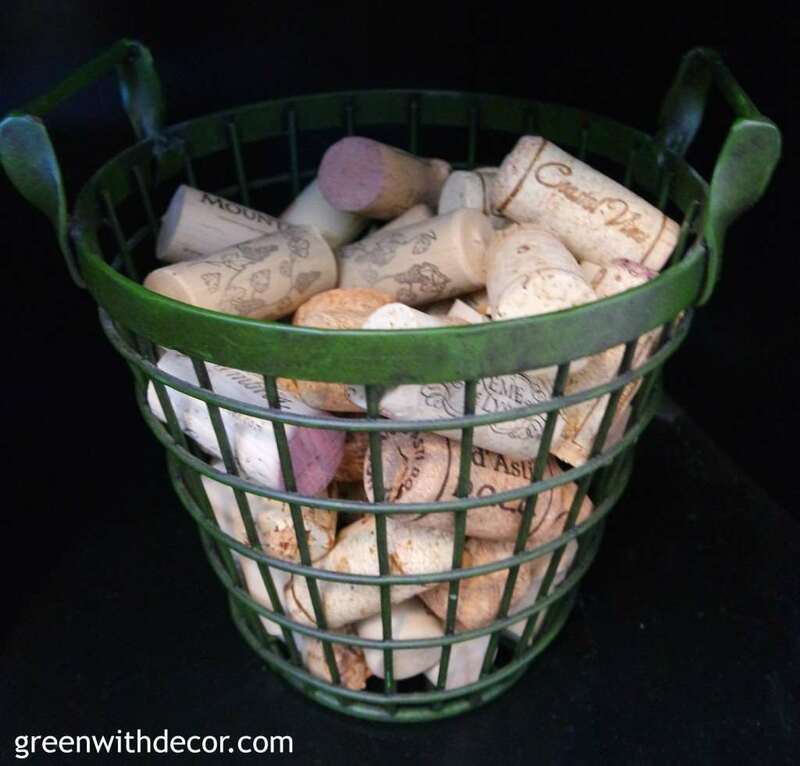 I love this basket full of wine corks for a little decor. The walls are the same wonderful Camelback paint color from Sherwin Williams that I have throughout the house. We also got new carpet and new blinds to really update the whole room. 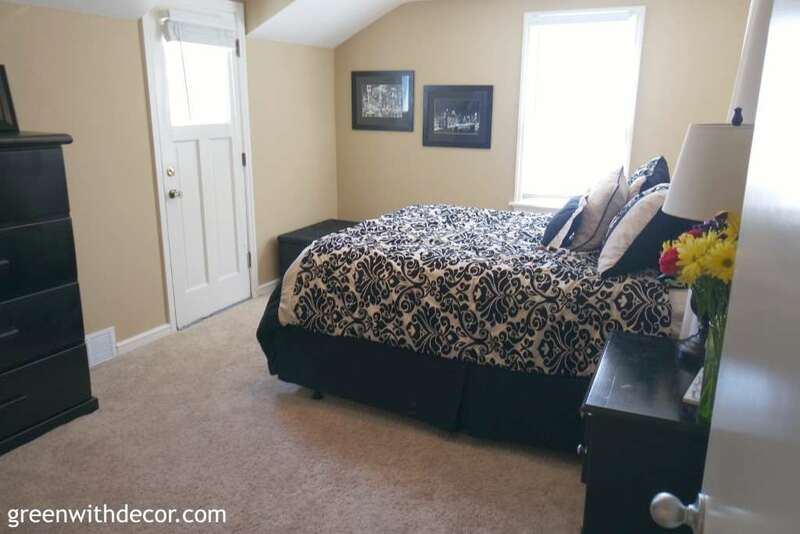 How do you decorate your guest room? It looks so beautiful and cozy! Our guest room — well, let’s just say that the moment someone says they’re coming to visit, i’ll be heading to the store for some sheets and decor! haha! Thanks, Christine! I am such a big fan of white woodwork – it really brightens up a space! Looks like a very warm and welcoming guest room. Great transformation. pretty! I wish I had decorating skills! Thanks, Alicia! I love decorating! It looks so good! Great job on the makeover! Oh I’m loving the little touches like the wine corks in the basket and the french inspired picture – super cute!! 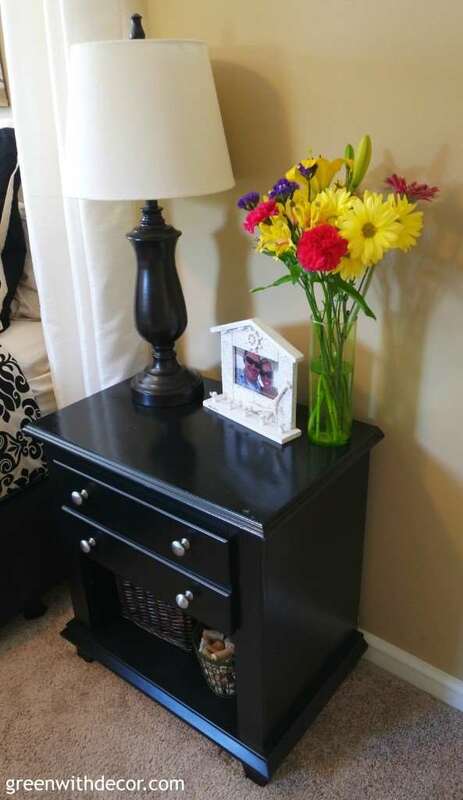 Wow, I would not have guessed the nightstand was spray painted; they look awesome! 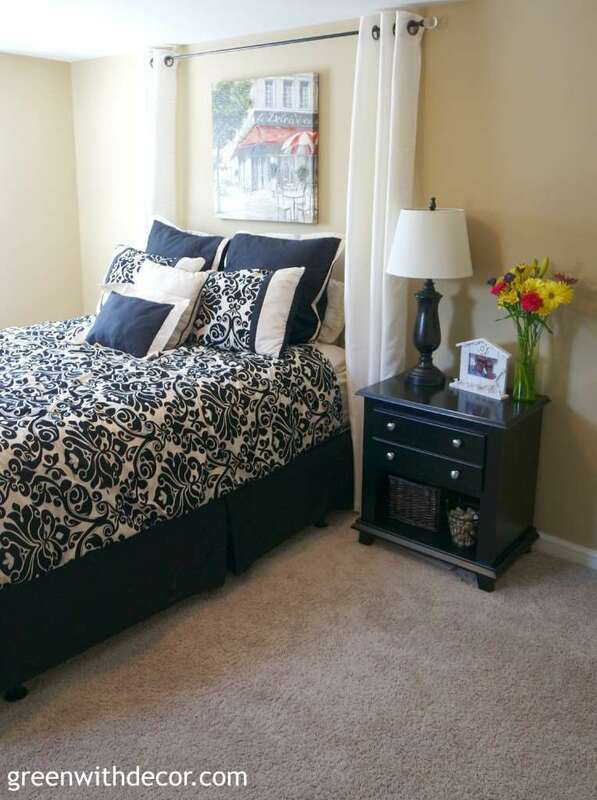 Love your guest room, it looks so inviting! I love everything about this room! My favorite is the curtains and painting behind the bed. Pinning this! Thanks, Nicole – and thanks for pinning! What a beautiful room, I love how clean and roomy it looks! Such a great transformation! I love the headboard idea! We don’t have a headboard and I like the hanging curtains. Very awesome idea! I love the curtains above the bed! Hopefully in our next house we have room for a guest room. 🙂 I daydream about that all the time. Ahhh love it! I love the curtains on the sides of the bed! 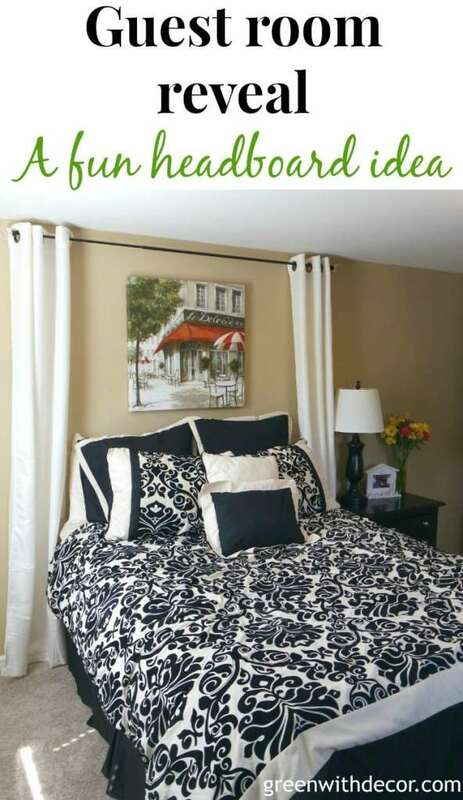 We are about to completely redo our guest room so thank you for the inspiration! Thanks, Claire! Good luck with your redo!